Yellowfin update: What’s happening in Dev Land? Among other things, the development team has been working to enhance the user experience of Yellowfin’s Business Intelligence solution. 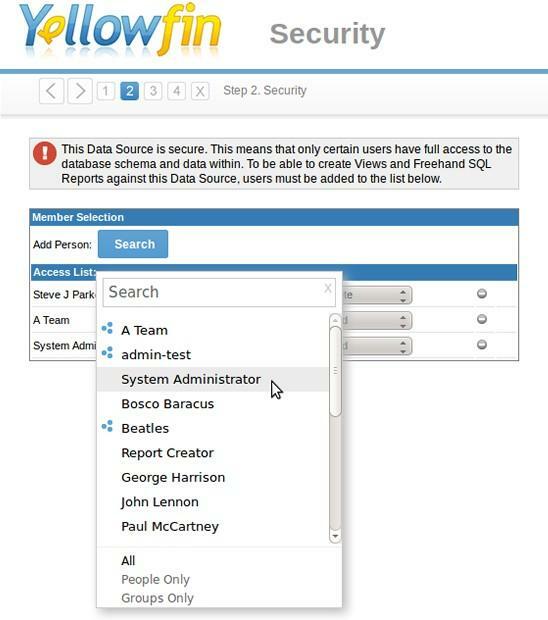 Ever used Yellowfin’s search function to find a user, group or role in order to grant that group or individual access to a specific data source or view? It’s a handy feature; but we thought it could be even better and easier to use. The users’ current page, which required a page reload, slowing down an essentially simple task. Ands let’s face it. No one likes to wait – especially if there’s no good reason for the delay. The new user search functionality has been streamlined into a single button for all searches; be it a user, group, role or LDAP (if applicable) – no more dealing with pesky pop-up windows. And, gone are those time consuming, full-page reloads. Now, via a floating search box, results are returned as soon as you start entering text. So, we’ve improved the search method; but what about search results? Is your search returning too many options? Now you can restrict the results returned by selecting options like “People only” or “Groups Only”. But what if the limited search is too restrictive? Or you can’t remember a users name? Simple; just click on the “All” option to see all users. The new search functionality, along with a number of other enhancements to Yellowfin’s user experience, will be available in the next major release in November 2012.